Painted in 1927, by muralist Edward Trumbull, the work was originally the third mural in the Graybar Passage. 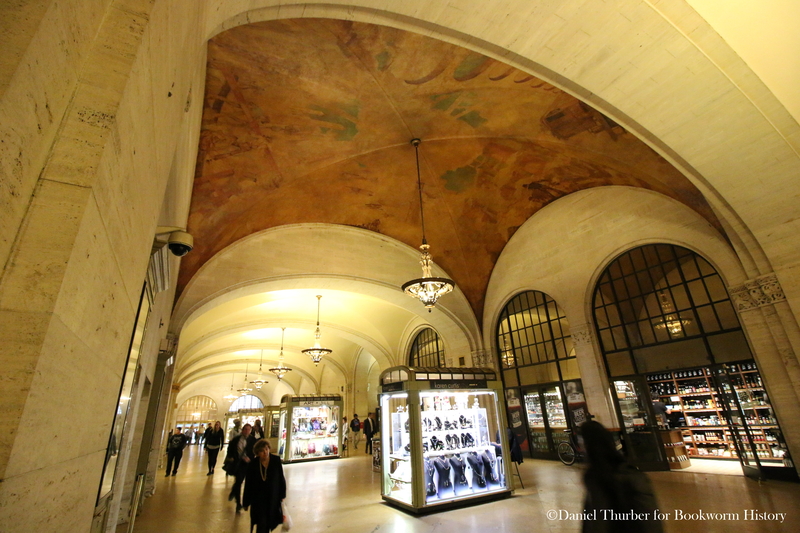 According to the New York Times, as you enter the Passage from Grand Central the first two vaults were painted with cumulus clouds, designed to make “the vaults appear higher than their twenty-eight feet.” The third vault is home to Trumbull’s work, and displays on each of its four sides influential technologies that had, and would continue to shape the world. The west side displays a train being pulled by an electric locomotive, illustrating the prominent use electricity had recently found in the railroad industry. The bridge the train passes under bears a strong resemblance to the original design of New York’s High Bridge (while picturesque, it is worth noting High Bridge was an aqueduct, not a railroad bridge, although trains ran under it as depicted). The north and south panel, respectively, show the raising of a skyscraper and the manufacturing of steel. The east side is devoted to aviation, picturing several airplanes (including the Spirit of St. Louis, as well as a Zeppelin) alongside a searchlight and radio tower. Born in Michigan in 1884, Trumbull was raised in Stonington, Connecticut. He studied painting at the Art Students League in New York, as well as in London under muralist Frank Brangwyn. Upon his return to the United States in 1911, Trumbull made headlines in a bigamy scandal after marrying (or attempting to marry) a Brooklyn socialite while already married to a woman he had known in London. Following the scandal, Trumbull moved to Pittsburg, painting several murals there, before returning to New York in the early 20s. In 1932 he was given the post of ‘colortone director’ for Rockefeller Center. His task was to “supervise the color co-ordination of the ornamentative program”, as a result of the “huge scale of the art work in Rockefeller Center”. Some of the larger works he oversaw as Colortone Director were the murals of Rock Center’s South Corridor, painted by his former mentor Frank Brangwyn. Over the course of his career he would paint murals in Chicago’s Museum of Science and Industry, New York’s Metropolitan Life Insurance Company Building, as well as his most famous work: the giant mural in the lobby of the Chrysler Building, painted in 1930. Trumbull’s style, as noted in his obituary in 1968, was “traditional”, what today we recognize as Art Deco. His work helped to enhance the architecture of some of the most famous Art Deco buildings. His obituary also notes his “use of bright and varied colors”, and while this can be seen in the Chrysler lobby, the Graybar mural is today a uniform shade of caramel. Over time the mural has darkened, the once-bright colors and details now a homogenous brown. While there have been recent restorations of several high-profile murals (Trumbull’s Chrysler lobby and Brangwyn’s Rock Center work are both shining again after years of neglect, to say nothing of Grand Central’s towering celestial ceiling), there appears to be no plans to re-touch the smaller industrial jewel of the Graybar passage. Good afternoon Dan, my name is Ketta Rella and I really like your explanation/discussion on Kubla Khan of Coleridge. It would be even better if it would be possible to have a written text of your explanation to follow it as you speak ? This is my humble opinion.